These 5 new cedar log cabins have two bedrooms, full kitchens and dishwashers, Weber BBQ pits, a small covered porch with patio furniture, fire pits, Satellite Television, Central Heating and Air. There is a queen size bed in each bedroom, a queen size sofa sleeper, and a futon combination couch sleeper in the main living area. The total area of each cabin comes to almost 768 sq feet. Room for the whole family and friends. Visit our Gallery for more pictures. Please note that smoking is not allowed in the cabins. $95 per night up to four people. After four, add $10 per night per person. $125 per night up to four people. 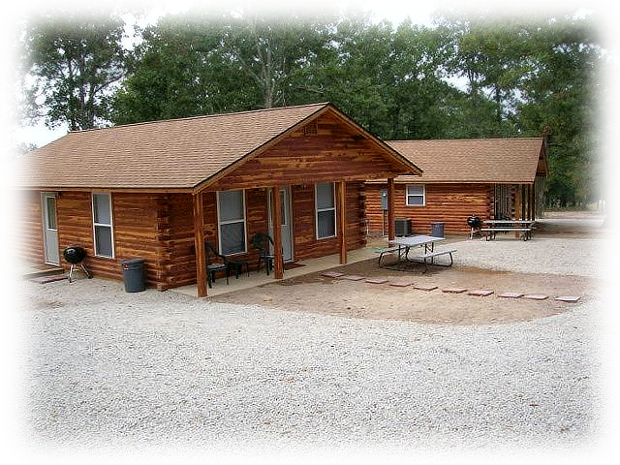 A $100 deposit is required at time of reservation, all deposits will be refunded after final inspection of cabin. Six night stay is $125 per night with 7th night free. A 14 day cancelation notice is required for deposit refund. All holiday weekends require three night minimum stay. Pets are always welcome at Lost Cove Resort. A $75 deposit is required per pet and $15 per day per pet. We require a $20 cleaning fee for one night stays.